DAZzle — combined with the patented Dial-A-Zip — became the basis for the software that comes free with the Endicia Internet Postage service. There isn’t a more robust mailing program on the market. Provides free tracking numbers for Priority Mail, First Class, and Standard Post: You can print electronic tracking for Media Mail for only $0.20 additional (a substantial savings from the Postal Service counter purchase). 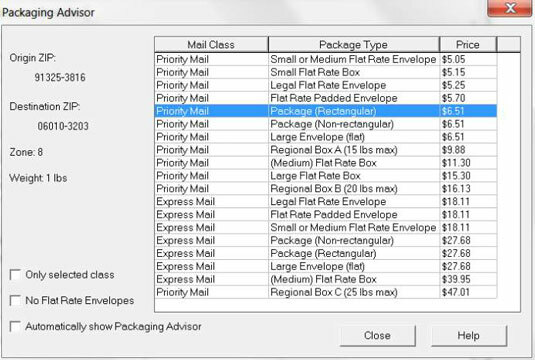 Packaging Advisor: The Endicia software gives you options for your package. After pasting in the recipient’s address, you can click to compare the costs of various USPS options based on the ZIP codes provided. Fetches your eBay orders from PayPal: After connecting your eBay account, the premium version of the service will import your sales and allow you to print in bulk — or one by one and automatically send the tracking number back to eBay. Print customs forms: You no longer have to go to the post office with your international packages. Just print the customs form from the DAZzle software (some are integrated into the label) and give the package to your letter carrier. Enables you to design mail pieces: The software enables you to design envelopes, postcards, and labels with color graphics, logos, and text messages. You can print your labels with postage tracking on anything from plain paper (tape it on with clear tape) to 4″ x 6″ labels in a label printer. Integrates with U-PIC private insurance: If you’re saving time and money by using a private package insurer, you can send your monthly insurance logs electronically to U-PIC at the end of the month. Endicia offers two levels of service. All the preceding features come with the standard plan for $9.95 a month. The premium plan adds special features, customizable e-mail, enhanced online transaction reports and statistics, business reply mail, return shipping labels (prepaid so your customers won’t have to pay for the returns), and stealth indicias for $15.95 a month.